Home Blockchain Has Anyone Actually Seen A Blockchain? A healthy degree of skepticism and cynicism have served me well in my career. And I’ll be the first to admit I do not fully understand all the finer points of some new technologies. Who am I to question the viability of new and disruptive technologies? I mean, I owned a Commodore 64 computer back when that was en vogue and I wrote some stuff in basic back in the day. But does any of that qualify me to question these new AI and distributed ledger products that have become prevalent today? And how is that we’ve come to rely so heavily on technology that we do not completely understand? I’m not talking about how to use it. With the right UI and UX, it’s usually not that difficult to figure out how to use a piece of software. Spend enough time toiling away and you’ll figure it out. But has anyone ever seen a blockchain? How about an AI algorithm? We’re not talking here about some freeware application that you can download from the internet. Blockchain and AI seem like these black-box tools that most people don’t understand and few, if any, truly want to understand. People just want to know if it works, if it solves their current problem. Most people do not understand aeronautics either, but 700 million people fly on planes each year. Planes solve the problem of long-distance travel. In the end, that’s what all of this is about — solving problems. You can call the latest software or hardware whatever you like. In fact, some have some really bizarre names. The question, however, is not how does blockchain work, but whether blockchain can solve a problem. If two people or entities want to exchange something of value reliably and securely without traveling to visit a financial institution and filling out a bunch of forms, then I think we’re onto something. Think about all the things that could happen on the way to the bank if you had to do it the old-fashioned way. And who the hell has time these days to go to a bank anyway? Similarly, with AI and machine learning we solve enormous problems associated with massive amounts of data. Having the ability to automatically identify, compare, and categorize relevant or important documents faster and at a fraction of the cost is a very real and growing problem in the legal business. Obviously, these are simplified examples. But you get the point. It’s not necessary to understand every intricate detail in order for the technology to actually work. So, what’s the excuse for not fostering wider adoption? When someone in the legal business suggests to me that technology is damaging professional legal services and putting lawyers out of work, I become incensed. People freaked out when they thought that ATM machines would replace bank tellers. And to some extent, this sentiment may have been justified at the time. But guess what? It turns out that ATMs did not replace tellers. Some studies suggest an actual increase in the number of tellers, although more bank branches contributed to the increase. The point is that new technologies do not eliminate legal jobs or any jobs. Not even robots will do this. They actually create jobs. With machines performing the more repetitive and mundane tasks, it frees up people with skills to deal with more meaningful issues the machines cannot handle, leading to more lucrative and fulfilling roles. I’m hoping I’ve had to make this argument for the last time. If not, someone is going to have show me a real blockchain…. 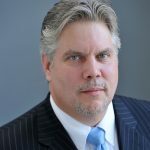 Mike Quartararo is the managing director of eDPM Advisory Services, a consulting firm providing e-discovery, project management and legal technology advisory and training services to the legal industry. He is also the author of the 2016 book Project Management in Electronic Discovery. Mike has many years of experience delivering e-discovery, project management, and legal technology solutions to law firms and Fortune 500 corporations across the globe and is widely considered an expert on project management, e-discovery and legal matter management. You can reach him via email at mquartararo@edpmadvisory.com. Follow him on twitter @edpmadvisory. Previous articleU.S. Bank Hires a Former Ripple (XRP) Partner, Will They Integrate?